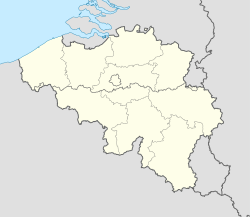 Saint-Gilles (French, pronoonced [sɛ̃ ˈʒil]) or Sint-Gillis (Dutch, pronoonced [sɪnt ˈçɪlɪs] ( listen)) is ane o the nineteen municipalities locatit in the Brussels-Caipital Region o Belgium. Saint-Gilles haes a multicultural identity stemmin frae its diverse population. For example, the central square (French: Place Van Meenen, Dutch: Van Meenenplein) hosts the annual festival o Brussels' Portuguese community. The hoosin stock varies frae semi-derelict tenements near the Brussels-South railway station in the north, tae elegant patrician hooses on the soothren borders wi Uccle an Ixelles, tae tourist hotels at the inner end o the Chaussée de Charleroi/Charleroisesteenweg. The first hooses o the hamlet o Obbrussel (meanin Upper-Brussels) wur biggit atween the 7t an the 11t century close tae Brussels’ top elevation at Altitude 100, nou pairt o Forest. In 1216, follaein strang demographic growthe in the aurie, the Forest Abbey alloued Obbrussel tae acome an independent parish. This unthildom, housomeivver, wis tae last anerlie aichty years, efter which the admeenistration o the veelage wis gien tae Brussels. Bi the 16t century, Obbrussel haed grown tae 41 hooses. In 1670, follaein orders frae the Spainyie govrenment, the Coont o Monterey biggit a fort in Obbrussel as pairt o the fortifications o Brussels tae pertect the ceety o Brussels against possible attacks. Erectit in 1675, this fort wis dismantled in the follaein century tae gie wey tae several important toll roads an urban development. The name o the Barrière de Saint-Gilles/Bareel van Sint-Gillis neighbourhuid still commemorates those tolls tae this day. Durin the French regime, on August 31, 1795, the veelage, bi nou cried Saint-Gilles efter its patron saunt an main kirk, merged wi neighbourin veelages tae form Uccle. Four years later, it gained its unthildom again, wi its awn mayor an municipal coonsel. In 1830, Brussels became the caipital o newly foondit Belgium. As a result, the rural veelage o Saint-Gilles, kent for centuries for its cabbitch cultivation, went throu an unprecedentit construction spree. The population went frae 2,500 aroond 1800 tae mair nor 33,000 in 1880 tae a peak o 60,000 in 1910. The streets pattern wis completely remodeled in the 1860s bi airchitect an urbanist Victor Besme. Thir wur the years when the Louise Avenue, the Brussels-South railway station, an the new Saunt Giles kirk wur biggit, tae be follaed suin efter bi the new jyle an ceety haw. The day, Saint-Gilles is ane o the densest municipalities o the Brussels agglomeration. Pairticular airchitectural delicghts are foond in the dozen or mair Art Nouveau hooses designed bi maisters sic as Horta, Struyvens, an Hankar, dottit aroond the upper pairt o the municipality. The hoose that Horta designed for hissel, nou the Horta Museum, is locatit thare, on Rue Americaine/Amerikaansestraat. Several o those hooses hae been recognised as Warld Heritage Steids bi UNESCO in 2000. The imposin toun haw, biggit atween 1900 an 1904, leuks lairger than it is, an bears a splendid resemblance tae a French château wi Venetian overtones. The extant Gothic revival jyle an the demolished Palais de la Monnaie/Munthof (mint) baith date frae the 1880s, while Saunt Giles's kirk wis biggit in 1867. Thare is no a lot o open space in the municipality, awtho the Parc de Forest/Vorstpark abuts its wastren side. The local cooncil uisually haes a socialist majority, an the current mayor is Charles Picqué, who is an aa Meenister-Preses o the Brussels-Caipital Region. Saint-Gilles’s dense population is well served bi public transport: the Brussels-South railway station wi its internaitional heich speed connections sits at the northren tip o the municipal territory, an the unnergrund premetro line passes soothwards throu it. Inhabitants hae access tae the 3, 4, 55, 81, 90, 91, 92, 93, 94 an 97 trams as well as buses 48 tae Stalle, 134 tae St-Job, 136/137 tae Alsemberg, 365 tae Charleroi an W tae Waterloo. Thare are twa pods o Cambio shared caurs, opposite the Horta metro station an ootside the Siemens trainin centre near Place Janssens/Janssensplein. A caur is an aa steidit at the Village Partenaire businesss centre at Rue Théodore Verhaegen 150. Saint Gilles haes a fitbaa club cried Royal Union Saint Gilloise, which wis successfu till the 1930s. Bernier, Fernand (1904). Weissenbruch, ed. Monographie de Saint-Gilles lez-Bruxelles - Histoire et description illustrées (in French). Brussels. OCLC 80713780. Wikimedia Commons haes media relatit tae Saint-Gilles (Brussels). This page wis last eeditit on 4 Mairch 2018, at 02:36.